At Del City, we carry a wide variety of wire connectors ranging from electrical systems and wire terminals, to quick splices and tap connectors. Our selection of connection systems includes: Weather Pack, Deutsch DT, DTM, DTP, DTHD Series, Deutsch Compatible A-Series, Metri Pack 280, Packard 56, and GT 150, 280 and 150/280 Mixed series connectors. Along with additional electrical connectors including wire terminals, quick splices, and tap connectors. From engine compartments and custom wire harnesses, to industrial equipment, we carry the wire connectors and terminals needed to setup your connections. Our extensive selection of electrical connectors features a variety of characteristics to meet the needs and demands of your unique system. The Weather Pack Series is a premium, environmental line of sealed connectors designed for engine compartments and wire harnesses. 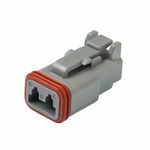 The Deutsch wire connector line is designed to provide a high quality and reliable connection. Deutsch connectors are available in four different series, to fit a variety of applications.The Deutsch compatible A-Series line features electrical systems that are a high-performance, cost effective solution to standard systems. Metri Pack 280 connectors are an OEM style system for varying engines from agricultural to automotive and marine. The Packard 56 Series is designed for use in classic car builds, replacements, and restoration.The GT Connection System's terminal-to-terminal mating force is the lowest in its class, rugged, and waterproof for off-road applications. We have all of the components and tools needed for a complete connection system available for you here. Don't need an entire connector system? We also offer standard wire connectors for easy and durable electrical connections. Quick splices and tap wire connectors allow you to make a fast and reliable connection between a new wire and existing wire. While our wide selection of wire terminals ensures you have just the right connection. Additional closed end, wire caps, and underground wire splice kits are available as well. From primary wire to heat shrink terminals and connector systems, shop Del City for all of your wire and electrical connection needs!